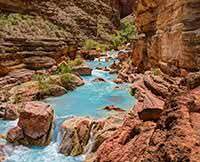 Great Western River guides, they really know the Grand Canyon, the history and geology. This was an awesome rafting trip. Great food, Greg and Trent are SUPER guides! The Grand Canyon 7 day trip has more hikes and time to enjoy the experience...Try to artrange the full 7 day trip if you can, you won't regret the experience.